Our Instant Formula for Drosophila Culture. 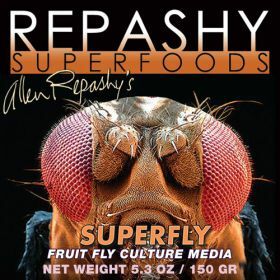 This Premium Mixture is fortified with Minerals, Trace Elements, Vitamins, and Carotenoids in order to Maximize the Nutritional Value of Fruit Flies when they are Used as Feeders. DIRECTIONS: To make a typical culture (32 oz. size deli container) add between 3 tablespoons (typical when using boiling water) and 4 tablespoons (typical when using hot tap water) SuperFly medium to 2/3 cup prepared water and stir until blended. Finished mixture should be thin enough to flatten out when container is tapped on table. Add water or medium to adjust consistency if necessary. Let cool before adding flies. Add flies and keep at approx 75F. Culture should begin to produce larvae in 5 - 15 days and flies in 10 - 30 days depending on temperature and species. Makes up to one culture per dry ounce. INGREDIENTS: Potato Granules, Brewer’s Dried Yeast, Fructose, Hominy Feed, Alfalfa Meal, Cinnamon, Dried Kelp, Dried Watermelon, RoseHips, Hibiscus Flower, Marigold Flower, Paprika, Turmeric, Salt, Citric Acid, Magnesium Amino Acid Chelate, Zinc Methionine Hydroxy Analogue Chelate, Manganese Methionine Hydroxy Analogue Chelate, Copper Methionine Hydroxy Analogue Chelate, Selenium Yeast. Calcium Propionate, Methylparaben and Potassium Sorbate (as preservatives). Vitamins: (Vitamin A Supplement, Vitamin D3 Supplement, Calcium L-Ascorbyl-2-Monophosphate, Vitamin E Supplement, Niacin, Beta Carotene, Pantothenic Acid, Riboflavin, Pyridoxine Hydrochloride, Thiamine Mononitrate, Folic Acid, Biotin, Vitamin B-12 Supplement, Menadione Sodium Bisulfite Complex). Guaranteed Analysis: Crude Protein min. 12%, Crude Fat min. .8%, Crude Fiber max. 2%, Moisture max. 8%, Ash max. 7%, Calcium min. .5%. Fantastic Media! It outperformed every media I have tried in all aspects. Which is not surprising considering the time/effort Allen puts into his products ;). My flies seem larger, healthier, more active and seem to live longer too. No mold, less mites, and no smell. I will be using this from now on.